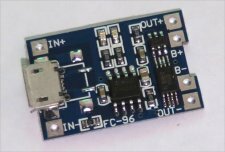 Based around the TP4056 charger IC and DW01 battery protection IC this module will offer 1A charge current then cut off when finished. Futhermore when the battery voltage drops below 2.4V the protection IC will switch the load off to protect the cell from running at too low of a voltage - and also protects against over-voltage and reverse polarity connection (it will usually destroy itself instead of the battery) however please check you have it connected correctly the first time. The red LED indicates chaging in progress, green LED indicates charging has finished.